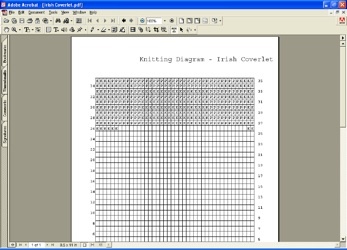 Create custom knitting grids in minutes! Bring your knitted concepts to life with Knitting Wizard! 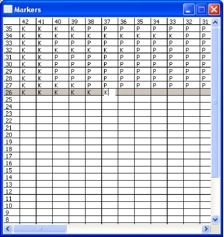 Save time, and avoid the numerous mistakes that come with transferring your designs to graph paper, with Knitting Wizard's "goof proof" menu. Open the Markers button and create your pattern in the grid (shown here). You can adjust the grid as you're working on the design - Knitting Wizard will retain all the information you've entered! Once you've added the information, just click the Generate button, and you're done. It's that easy. And your custom diagram is saved as a .pdf file, which lets you print them on any printer you wish, from anywhere! You can download a copy of Knitting Wizard to try out - before you buy your copy. See the download options at the bottom of this page. Knitting Wizard is only $19.99, which entitles you to all updates and new versions released over the next full year, free of charge, which of course you can continue to use forever. Also available in dmg format.